An entertaining little friendly today at Wembley between England and Mexico that should be of considerable interest to U.S fans less than three weeks ahead of the World Cup. First-round opponent England won 3-1 over our neighbors bitter, much-loathed rivals, but it was the Mexican team that carried the play in the first 45 minutes with a quality display of possession and flair that proved a handful for the Three Lions. It was something of a makeshift back-line deployed by Fabio Capello, as he held out the five Chelsea players on the roster (only 9 days removed from the FA Cup Final), including near-certain starters John Terry, Ashley Cole and Frank Lampard. It was their slow-witted replacements, notably Ledley King, whose statuesque (not in the complimentary meaning of the word, but in the fact he appeared to have the range and effectiveness of a statue) performance was hardly saved by his goal off a set-piece. Both King and fellow centreback Rio Ferdinand were caught by the lively Mexican duo of Giovani dos Santos and Carlos Vela, the latter going 0-2 on shots where he had only goalkeeper Robert Green to beat. That was the story of the night for El Tri as, despite a possession advantage and sending 23 shots goalward, they managed just to convert the one time. England were more assertive in the second 45 minutes and a Glen Johnson stunner early in the second half killed off the tie. But there were precious few highlights for the England men, who will hope the return of the Chelsea Five produces a better all-around effort next time out. England head to Austria for pre-Cup training and a friendly on Sunday against Japan, while Mexico get right back at it with a Wednesday tilt against Netherlands. In other notable friendlies, host South Africa was held 1-1 by Bulgaria and Portugal stumbled to a scoreless draw with Cape Verde. That doesn’t bode well for the Portuguese. 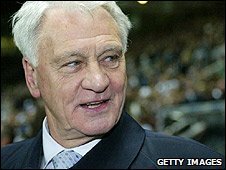 The former English football manager, Bobby Robson, died last night of cancer at age 76. Not to disrespect the recently deceased … but is a World Cup semi-final (in 1990) all it takes to become a sir? Serious question, and I hope this doesn’t make the people of Ipswich hate me, as Robson lead them in their glory days. Well, I’m gobsmacked. Chelsea captain/England skipper John Terry’s mom and mother-in-law got pinched for stealing around 800 GBP worth of clothes and food from UK shops Tesco and Marks and Spencer. That’s a lot of HP Sauce.